Discussion in 'IOTA (IOTA)' started by CryptoCiticoins, May 25, 2018. On May 25th,2018, UN announced that UNOPS(The United Nations Office for Project Service) will team up with IOTA, to optimize official workflows and enhance the efficiency of work. IOTA uses a special technique called Tangle which is built on a mathematical concept known as Directed Acyclic Graphs(DAG). Unlike other traditional blockchain technologies, Tangle has no block, no chain and also no miners. That’s one of the reasons why UNOPS chose to cooperate with IOTA. Besides, IOTA’s ledger is easily compatible with internet of things devices, which do not have high computing requirements. We will offer “Training workshops” and “Thought leadership seminars” and develop the specific proof-concepts to bring greater efficiency to specific areas of UNOPS work. At present, the collaboration is educational in nature. So UNOPS cannot predict how long will it take to move from a pilot phase to fully implementing IOTA’s technology. But, UNOPS believed that IOTA’s technology is promising through analyzing some current cases existed in the world otherwise UN wouldn’t experiment with IOTA’s tech. Iota price has reached around $1.84, the most highest price of 7-days data with 5,126,065,338 USD. The price descended at the end of May,21th and rewarm again at the end of May,24th. Now the price is taking strive to $1.60. According to the exchange rate of hkd to usd, iota coin is worth 12.23hkd, as for RMB, is 9.97RMB. Iota’s special technique is regarded as a promising technology to blockchain by many authoritative institutions and organizations, unlike other many cryptocurrencies, will it be the mainstream in the future replacing the dominant position in blockchain? What do you think of that? IOTA is a crypto token that is a combination of the Internet of Things and blockchain technology. The IOTA blockchain allows transactions to happen between IoT devices, helping accelerate IoT adoption globally. As there is no transaction fee, and coupled with the peer-to-peer transaction, IOTA has no scalability problems. The growth of the speed is exponential. Therefore, we will get a network with high speed if number of people start using the network. Being the first one to guarantee zero transaction fees, IOTA certainly seems to have an interesting future. Currently under development stages, if it achieves all its objectives, it has the potential to dominate the market. MIOTA is currently valued at $0.4809 with a 1-year growth forecast of $3.214 and a 5-year forecast of $9.847. How are nodes compensated or incentivized to support the IOTA tangle? Where does the financial $ value of the token come from if transactions are free? I Agree with Rose Martin. Due to its zero transaction fees, IOTA will definitely have a bright future. 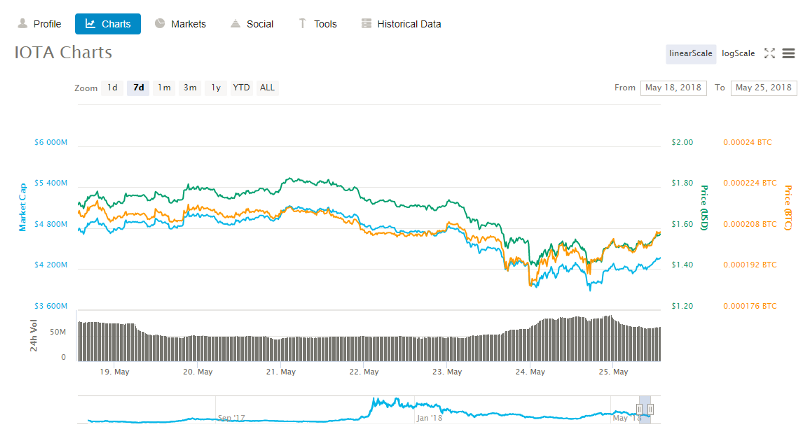 According to industry analysts, the IOTA value has been bullish over the last 12 months with promises of a positive trend in the near future. Currently, MIOTA (IOTA) is trading at $0.5145 with IOTA price 5.58% up today. 1 IOTA to BTC is 0.00007897 Bitcoin. It's a good rise in the cost for Bitcoin. I agree that the technology is amazing and use cases seem unlimited, but the tangle needs nodes. How are nodes compensated of there are no fees? What gives the token value? I actually want to be invested in IOTA, but I can’t get past this first question.